Similar to The Purge, THE BELKO EXPERIMENT is an obscene horror populated with seemingly innocuous characters ready to take lives at a moment's notice as soon as repercussions are no longer on the table. But what makes this film particularly scary is that it takes place in Corporate America, which can be, if you've seen any horror movie ever, one of the most threatening settings outside of a white suburban neighborhood. You look at me, but you know I'm right. And this movie may or may not get that (truthfully, I doubt director Greg McLean or screenwriter James Gunn were thinking this way), but as a minority woman I can't help but see the socio-political parallels. It starts out innocent enough though, like any other day at the office (this one being Belko Industries). There's the new girl (Melonie Diaz), the secret office couple (Adria Arjona and John Gallagher, Jr.), the one black woman (Gail Bean), the one black guy (James Earl), the white guy (Tony Goldwyn), the white guy (John C. McGinley), and the white guy (Brent Sexton). At the top of the morning, after begrudging cubicle and office courtesies are exchanged, a gruff voice thunders over the intercom warning them that their building is under siege and they must comply with every heinous demand by this indiscernible yet dangerous stranger. They are told that only a certain number of them will survive the day and they must start killing each other off or else this unknown voice will do it for them. At first, they take it as a joke. But when several employees start meeting their fates, panic propels each of them to turn into the monsters they feared. What makes this movie interesting is how race, age, and gender politics in the workplace are represented. 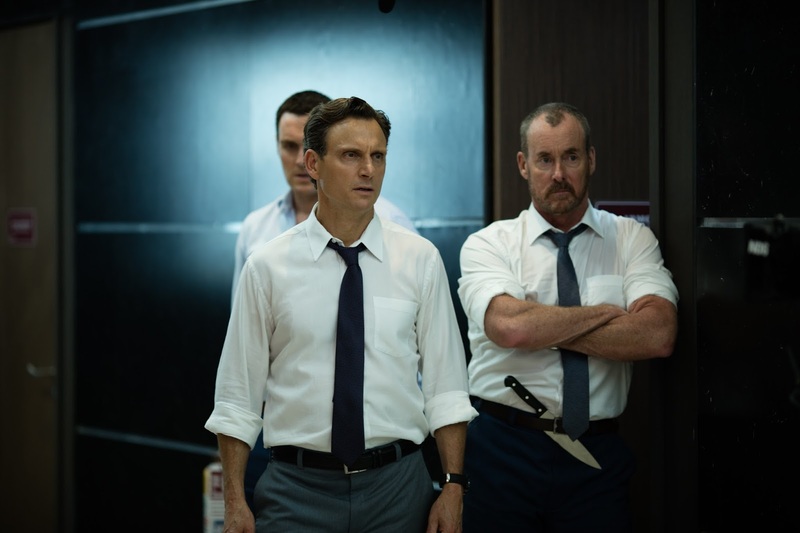 When things start to get bloody, it becomes clear that two of the white men in the office, Mike (Gallagher) and Barry (Goldwyn) have led the staff into two sectors—outright murderers and diplomatic heroes. Though Mike represents the heroic group, it's telling that he is leading the staff most consisting of minorities, women, and older employees. No, not a woman, a minority, or an older employee, but a 30-something year-old white man whose heroism comes at the cost of the lives of his less privileged colleagues than anything else. On the other hand, Mike, the company's senior director who oversees the entire staff is quick to abandon his leadership duties and grabs the biggest gun he can find to take out the first helpless employee who crosses his path—with his white white male posse, one half consisting of a pervert who harasses women in the office. Meanwhile, as the two white men fight to the death, the staff who don't pick up a weapon—including women and minorities who are dependable, practical, genuinely A+ employees, some just biding their time until retirement—slowly yet steadily become insignificant. Mind you, all of this literally goes down in a number of hours. It takes less than a day for everyone in this office (or really, just the white guys) to go truly insane once their livelihood is jeopardized. THE BELKO EXPERIMENT isn't the type of horror film that should remain in your mind long after you've watched it, though it's taut, gripping, and certainly frightening at times. But in today's capitalist society further complicated by Trump politics, it's hard not to see its incidental subversiveness on a whole new level. I wonder if they'll touch up on that in interviews? I've been wanting to see this for a while. The trailer looked good. Omg, this review is so on point! It's a metaphor for corporate America today, that's for sure, but I wonder if the filmmakers really understood all the levels on which that is true?